This classic duo lends an air of sophistication to any outfit. 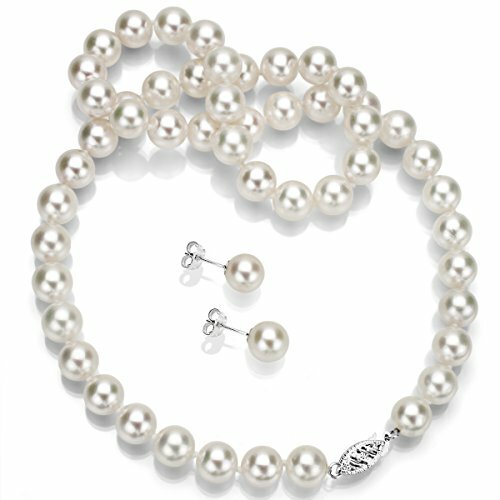 Wear the 18" hand-knotted strand of pearls and matching stud earrings as a set or individually. The clasp and posts are created of solid 14K white gold. FROM THE SHORES OF ASIA - These beautiful saltwater pearls are cultivated from Akoya oysters grown at pearl farms along the coast of Japan. The pearls are hand-selected and carefully chosen to meet La Regis standards of excellence. VIRTUALLY FLAWLESS - AAA-graded pearls are the highest-quality and have no visible flaws. Akoya cultured pearls are renowned for their brilliant mirror-like lustrous shine and thick nacre. Their perfectly round shape, smooth surface, and white color make Akoya pearls the most popular in the world. THE PERFECT ACCESSORY - Pearls add class and elegance to every outfit - from casual to dressy. Long a favorite of brides, they are the perfect choice for that special day. Pearls are always a welcome gift for girls of all ages - ideal for bridesmaids, best friends, moms , or any special woman in your life. THE PEARL EXPERTS - As a founding member of the Cultured Pearl Association of America (CPAA), La Regis Jewelry helped create the standards for today's pearls.